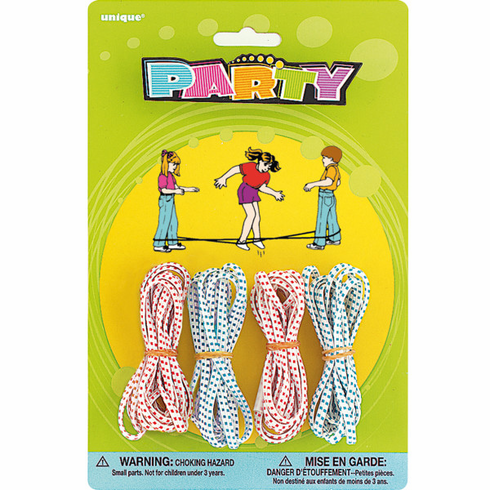 Add to the joyous mood of celebration with the cute and fun Unique Industries Assorted Chinese Jump Ropes Party Favor. This pack contains four toys. Simply gift wrap these jump ropes charming pack in a quirky Unique Industries gift wrap paper and place it in a charming cello bag or gift bag to give away as a party favor. Recommended for children three years and up. Brand: Unique Industries Includes four toys. Available in a variety of toys, each sold separately. Warning: Choking Hazard: Small Parts. Not for children under three years.